One of the things you learn when attending Sematext Solr training is how to scale Solr. We discuss various topics regarding leader shards and their replicas – things like when to go for more leaders, when to go for more replicas and when to go for both. We discuss what you can do with them, how to control their creation and work with them. In this blog entry, I would like to focus on one of the mentioned aspects – handling replica creation in SolrCloud. Note that while this is not limited to Solr on Docker deployment, if you are considering running Solr in Docker containers you will want to pay attention to this. When creating a collection in SolrCloud we can adjust the creation command. Some of the parameters are mandatory, some of them have defaults and can be overwritten. The two main parameters we are interested in are the number of shards and the replication factor. The former tells Solr how to divide the collection – how many distinct pieces (shards) our collection will be split into. For example, if we say that we want to have four shards Solr will divide the collection into four pieces, with each piece having about 25% of the documents. The replication factor, on the other hand, dictates the number of physical copies that each shard will have. So, when replication factor is set to 1, only leader shards will be created. If replication factor is set to 2 each leader will have one replica, if replication factor is set to 3 each leader will have two replicas and so on. By default, Solr will put one shard of a collection on a given node. If we want to have more shards than the number of nodes we have in the SolrCloud cluster, we need to adjust the behavior, which we also can do by using Collections API. Of course, Solr will try to spread the shards evenly around the cluster, but we can also adjust that behavior by telling Solr on which nodes shards should be created. The 56a02fb8d997 is the identifier of the first Solr container. Btw, if you are not familiar with Solr and Docker together, we encourage you to look at the slides of our Lucene Revolution 2016 talk “How to run Solr on Docker. And Why”. The video should also be available soon. The key point here is this: once you created a collection you can add more replicas, but the number of leader shards will stay the same. This statement is true even if we are using the compositeId router and if we don’t split shards. So how can we add more replicas? Let’s find out. Please remember that specifying the node name is not mandatory. We may actually let Solr choose the node for us. We still have to manually add replicas when we add machines though. Can this be changed? Automated? On a shared file system, Solr will automatically create replicas. Unfortunately, it is not possible to automatically spread Solr collection when new nodes are added to the cluster when Solr is not running on a shared file system. shard – the name of the shard or wild card. Tells Solr to which shards the rule should be applied, if not provided it will be used for all shards. We will see how to use these rules and operators shortly. We configure snitches when we create collection. The rules are persisted in ZooKeeper and will be applied to every shard. That means that during replica placement and shard splitting Solr will use the stored rules. Also, we can modify the rules by using collection modify command. 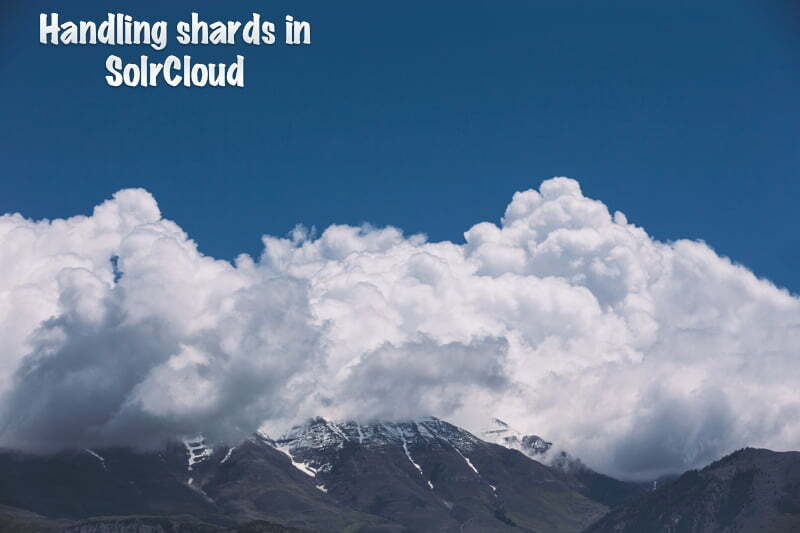 Till now we’ve discussed how shards and replicas work in Solr, at least till Solr 7. With Solr 7 things changed and new replica types have been introduced. The default behavior remained the same, but there are ways of creating new replica types – the new TLOG and PULL replicas (learn more about Solr 7 replica types in Solr 7 New Replica Types blog post). This changes what we can do with our SolrCloud cluster. Using appropriate replica types we can control how much we can trade near real-time searching and indexing, fault tolerance and high availability for performance. If you don’t need near real-time searching and indexing you can TLOG replicas and still have FT & HA and a higher performance, because of binary files replication along with transaction log. You want to have replication similar to master-slave architecture on top of SolrCloud – go for PULL replicas. As you can see there are way more options available as soon as we switch to Solr 7. The next thing that is awesome regarding the sharding and replication in Solr 7 is the autoscaling API. If I were to describe it in one sentence I would say that it allows us to define rules that control shard and replica placement based on certain criteria. We can tell Solr to automatically add replicas and control the placement of the replicas based on attributes like disk space utilization, CPU utilization, average system load, heap usage, number of cores deployed on Solr instance, custom properties or even a specific metric retrieved using Solr Metrics API. The nice thing about that API is that the rules can be applied to the whole SolrCloud cluster or each collection individually. That’s not all. We can configure triggers and listeners. For example, a trigger can be configured to watch for events such as a node joining or leaving our SolrCloud cluster. When such event occurs trigger will execute a set of actions. Listeners can be attached to triggers so that we can react to the triggers and the events themselves – for example for logging purposes. As you can see, we have lots of possibilities when it comes to shard creation – from simple control to sophisticated rules based on out of the box values and ability to provide our own. For me, rules are the missing functionality in Solr that I was looking for when SolrCloud was still young. I hope it will be known to more and more users. Want to learn more about Solr? Subscribe to this blog or follow @sematext. If you need any help with Solr / SolrCloud – don’t forget @sematext provides Solr Consulting, Production Support, and offers Solr Training! Thanks for the tutorial. Sounds like autoAddReplicas=true now works without a shared filesystem (SOLR-10397). This could be updated to say “before solr 7.1”..
> Unfortunately, it is not possible to automatically spread Solr collection when new nodes are added to the cluster when Solr is not running on a shared file system. Hi, thanks for the useful tutorial. I am seeing an issue in that if a node is restarted it fails to recover. The node shows as ‘gone’ then moves to ‘down’ as the container is restarted but never get any further. Do you have any ideas what might be causing this? One thing that comes to my mind is that Solr host name is not set and a new node that comes after the restart has a different IP/name. You can check that in Solr admin, in the Zookeeper file system tree with the live nodes. Can you check that? Hi, thanks for the reply. I have 3 solr nodes named ‘solr1’, ‘solr2’, ‘solr3’ respectively. Upon checking the /live_nodes section of the admin UI I see that each of them exist. The name doesn’t change after restart both in /live_nodes and the Graph tab. The logs suggest that solr has started successfully (2017-08-05 08:24:58.205 INFO (main) [ ] o.e.j.s.Server Started @2560ms) and has connected to zookeeper as expected (2017-08-05 08:24:57.759 INFO (main) [ ] o.a.s.c.ZkController Register node as live in ZooKeeper:/live_nodes/solr2:8983_solr). Any ideas? I have index size of around 300GB, and i was earlier using 5 shard 10 nodes solr cloud with solr 4.2 version. Meanwhile, we moved to solr 6.3 keeping in mind for shard splitting. I checked the state in state.json for nearly 48 hours , but the data copying got frozen up while reaching a certain range(for example:- 60GB data in parent node, after splitting, both child nodes got 24GB data, then data copying into child got stopped). The state.json file was not changing further. Moreover, when i manually changed state.json (parent node to inactive from active and child node to active from construction) i suffered a huge loss of data.I read that this issue was fixed in 6.3 , but i am still facing it.Any help regarding this will be greatly appreciated. Do you see anything in the logs on the Solr node that you are trying to split shard on? I’m interested in any warnings or error level information. Also, I assume you are using asynchronous collections API call for shard splitting, is that true?